Basil essential oil has sweet, green, herbaceous top notes with aniseed undertones. It is excellent for nervous disorders and for stimulating the mind. Also helpful for headaches, respiratory complaints and muscular tension. 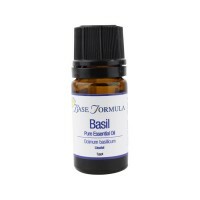 Basil essential oil is distilled from the leaves of the herb. The cultivar, geographic origin of the plant and its growing conditions significantly affect the chemical composition of the resulting essential oil - giving rise to different chemotypes (CT). CT Methyl Chavicol contains high levels of Estragole (Methyl Chavicol). Whilst Estragole is not considered toxic in itself, it is converted into a chemical which can be carcinogenic and hepatotoxic if used in high doses. Basil CT Linalol is therefore usually recommended for general use. Do not use on sensitive skin or whilst pregnant. Do not use in high concentrations or for long periods of time. Basil essential oil can be used as an insect repellent. 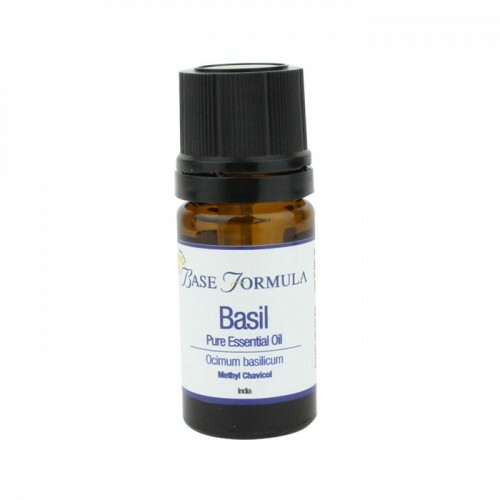 Basil is a stimulating oil that clears the mind, aids concentration and relieves intellectual fatigue. Also an excellent tonic for nervous disorders. Basil oil is beneficial for head tension and respiratory problems such as coughs, colds and asthma. The anti-spasmodic properties of the Methyl Chavicol are useful for muscle tension and pain, including stomach cramps. Also soothing for the digestive system particularly when stress or nerve related. 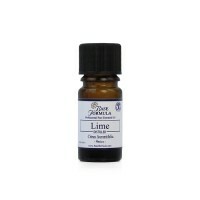 Most herbal oils, Bergamot, Lavender, Lime, Frankincense. Eugenol 15%, Geraniol 0.2%, Citronellol 0.3%, Limonene 1%, Linalool 62%.